May 25 - May 29 - 2019 - De website van outofarea! 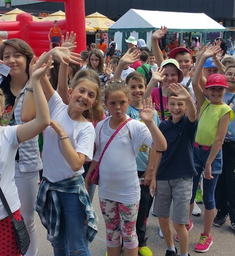 Out of Area foundation organizes festivals for children in former Yoegoslavia since 2001. The traveling FutureA 2019 festival will visit 4 cities in Bosnia & Herzegovina to entertain the children with workshops, dance, music and a big show. NL48 RABO 0132 7822 00 in name op Out of Area Foundation citing Futurea 921 and your name.